Selling on Amazon Referral Fee: Referral Fee has been revised for multiple product categories. To view the complete list of all categories with their revised referral rates, refer Table 1 below. Note: Please ensure that you ASIN is subcategorized correctly by mapping it to the right browsenode. Amazon will not be responsible for incorrect fee charged due to incorrect subcategorization. Selling on Amazon Closing Fee: Fixed Closing Fee structure has been revised for all product categories. We are offering discounts on the fixed closing fee for Easy Ship and MFN channels in the low item price range. We urge you to explore these channels for your low price selection. For details, refer Table 2 below. FBA Weight Handling Fees: We have revised FBA Weight Handling Fee structure to offer lower rates when your FBA inventory is shipped locally. With the new rate-card you can realize savings in your Weight Handling Fee if your FBA inventory is shipped locally or regionally. You will continue to receive the monthly Amazon FBA Weight Handling Report with details of your FBA orders shipped locally, regionally and nationally. 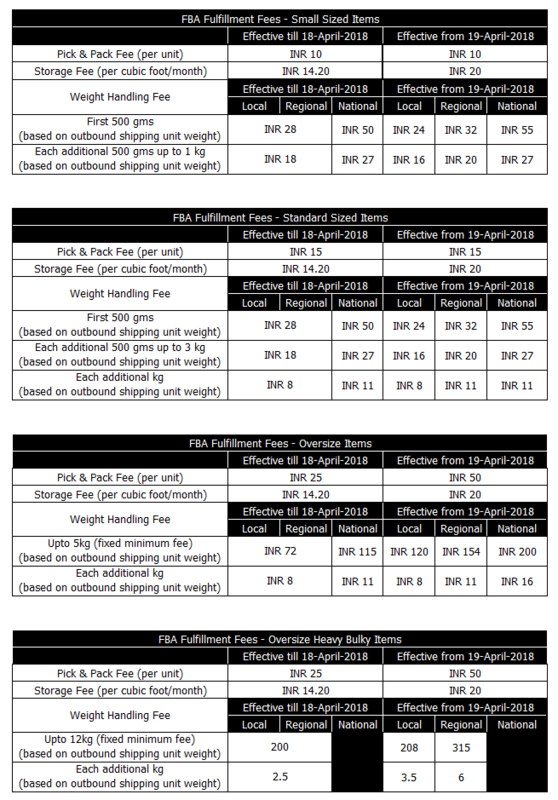 For details regarding the revised FBA Weight Handing Fee refer Table 3 below. FBA Pick and Pack Fee: We have revised FBA Pick and Pack Fee for Oversize and Heavy Bulky items. There is no change to Pick and Pack Fee rates for Small and Standard – size items. Refer Table 3 below for details of the revised rate card. You can view the inventory size classification details here. FBA Storage Fee: We have revised FBA Storage Fee rate for your FBA inventory. Refer Table 3 for details. Zero Fulfilment Fee for Items over INR 20,000: We will continue to offer Zero Fulfilment Fee (Pick & Pack Fee and Weight handling Shipping Fee) for all Small-size and Standard-size items priced over INR 20,000. First Three Months Free Removals: We will continue to offer free Pickup and Standard removals for the first 3 months to each new seller who signs up for FBA. Easy Ship Weight Handling Fees: The Easy Ship weight handling fee has been reduced for all Standard items weighing more than 500 gm. The charges for items upto 500gm remain unchanged. 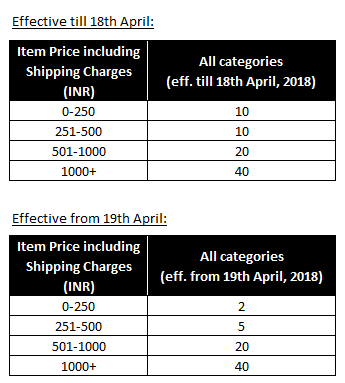 Please refer Table 4 below for Easy Ship weight handling fee details. Fees shown in the table above is displayed excluding taxes. 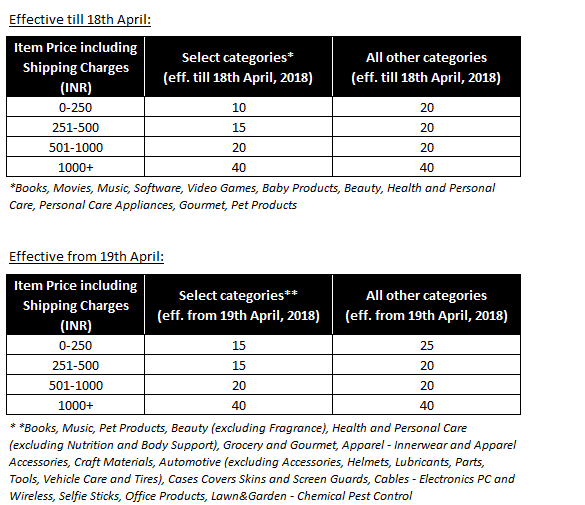 Amazon will charge 18% Goods and Services Tax on all fees displayed above. For FBA orders, the Outbound Shipping Weight is calculated for each individual shipment by adding the Packaging Weight to the overall shipment weight. We will use 80 gm, 100 gm and 500 gm as the Packaging Weight for Small, Standard and Oversize items respectively. For Standard and Oversize items weighing more than 1 kg, we use Dimensional Weight if the Dimensional Weight is greater than the Unit Weight. For Oversize Heavy and Bulky items we will use Dimensional Weight if the Dimensional Weight is greater than the Unit Weight. Dimensional weight is calculated using the formula, (Length x Width x Height) divided by 5000 to get the Dimensional weight of a unit in kilograms. Length, Width and Height are all in centimeters. Local rate will be applicable where the pickup and delivery happen in the same city i.e. intra-city pickup and delivery. Regional zone consists of 4 regions. This fees will apply if shipment moves within the same region and the service is not within the same city. National fee will apply if shipment moves across regions. Minimum chargeable weight is 500 gms. In case of items that weigh more than 500 gms, you will be charged in multiples of the price applicable for each 500 gms. For example, the Amazon Easy Ship Fees for 800 gms package being shipped to a regional location will amount to Rs.68 i.e. Rs.45 (charge for first 500 gms) + Rs. 23 (charge for next 500 gms). Amazon Easy Ship Fees is computed on volumetric or actual weight, whichever is higher. Volumetric weight is calculated as Volumetric Weight (kg) = (Length x Breadth x Height)/5000 where LBH are in cm. All listed fees are displayed excluding Service Tax. We will apply 18% Service Tax (GST) to all fees displayed above.